If there was a very simple and inexpensive way for you to stay healthy that didn’t involve medication, would you do it? Most of us would, and that’s when natural remedies come into play. With the increasing amount of multi-drug resistant bacteria, otherwise known as “superbugs”, it’s becoming essential to keep our immune systems in tip-top shape in order to prevent having to spend precious time, energy and money in hospital settings. Black cumin seed oil has been found to help just with that. 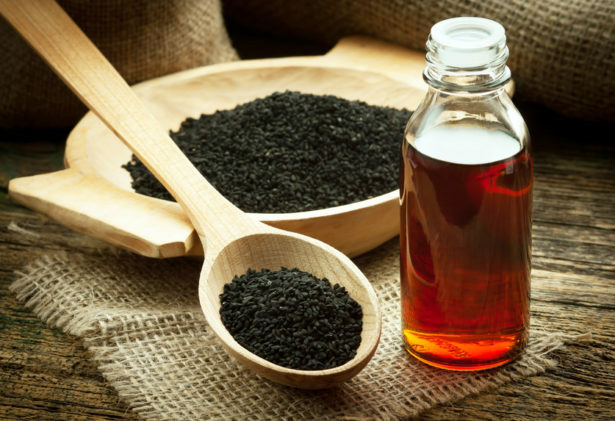 How to make black cumin: what is it? the presence of Thymoquinone, a compound able to induce cell death in cancerous cells. Over 600 studies have shown the authenticity of their effects and promising results in their use for the treatment of autoimmune disease, making it difficult to deny their powerful health benefits. Getting your hands on a big batch of them doesn’t seem like a bad idea now, does it? First, you want to grind your seeds until you get a fine powder. Then, you make a bain-marie with all the ingredients together, stirring until the coconut oil is completely melted. Once the water is boiling, reduce the heat and let the mixture sit over it for 10 minutes. Once it’s cold, pour it inside a glass flask or container and store it in a dark place for 10 days. Once the time has gone, the oil will have absorbed all the nutrients from the seeds and the mixture will be ready to use. You can use the oil for a variety of things and in different ways. For instance, you can use it on your scalp to stimulate hair follicle growth, by massaging the oil all over the area and let it sit for one hour, and you can even add a teaspoon or two in your shampoo bottle. You can do the same for other skin issues, such as eczema or psoriasis. Alternatively, you can mix it with some honey or yogurt and consume it a few times a day. Experts recommend taking the oil straight in order to benefit from all its nutritional goodness. Simply take 1 teaspoon of the concentrated oil two times a day on an empty stomach and/or before meals or bedtime. Keep in mind it’s a natural remedy, thus its benefits will begin to take effect after frequent consumption over a period of time. If you’re not one to deal well with drinking just plain oil, you’ve got an option: oil capsules. These may be hard to find around, but fear not, the internet has got you covered. These black cumin seed oil capsules will save you time (and disgust) and will make it easier for you to remember to take them on a daily basis.